Acta Cryst. (1996). A52, 7-10. 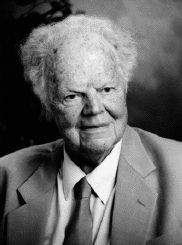 Arthur Wilson, who ranked amongst the world's leading crystallographers for almost half a century, died at his home in Cambridge on 1 July, in his 81st year. Arthur James Cochran Wilson was born in Springhill, Nova Scotia, on 28 November 1914 and was educated at King's Collegiate School in Windsor, Nova Scotia (1922/1930) and at Dalhousie University, Halifax (1930/36), where he graduated in 1934. It was at Dalhousie that he started his academic career and in 1936 he obtained an MSc, under the direction of Howard Bronson, for his work on the heat capacity of Ag, Ni, Zn, Cd and Pb as a function of temperature. He then joined Hans Mueller's group at the Massachusetts Institute of Technology, where he received his first PhD, in 1938, for a study of the anomalous thermal behaviour of the ferroelectric Rochelle salt in the temperature range -30 to +30°C. While at MIT, he was awarded an 1851 Exhibition Scholarship, which enabled him to go to St John's College and the Cavendish Laboratory in 1938, the year in which Sir Lawrence Bragg succeeded Lord Rutherford as the Cavendish Professor of Experimental Physics at Cambridge. During the remaining two years of his Scholarship, Wilson made accurate measurements of the thermal expansion of Al and Pb, which led to the award of his second PhD in 1942. More importantly, perhaps, it was through his work at the Cavendish Laboratory, and the influence of Bragg and Henry Lipson, who was effectively in charge of the laboratory during the war years, that Wilson acquired a life-long interest in X-ray crystallography. Wilson's contribution to crystallography while at Cambridge was largely concerned with three aspects of the subject. His work on thermal expansion involved the measurement of precise lattice parameters, which led naturally to a general investigation of experimental and other factors that influence the position, shape and intensity of X-ray diffraction lines. Together with Alec R. Stokes, he also became interested in crystal imperfections through a study of stacking faults in Co (1941/2) and in the alloy Cu3Au (1943), and a general treatment of diffraction effects due to small, distorted or otherwise imperfect crystals followed; his book X-ray Optics (1949; 2nd edition 1962) has been the starting point for much subsequent research in this field and is still a definitive work on the subject. These two aspects of crystallography relate to studies of polycrystalline samples, but the third and equally significant contribution was concerned with the determination of structures from single-crystal data. When asked to review a paper submitted to Nature in 1942 on deriving absolute from relative intensities of X-ray diffraction data, Wilson first became aware of the analytic power of crystallographic statistics. The complex method described in the paper stimulated a simpler and more direct approach to the problem, which was published alongside the original contribution. The practical importance of this work was not realized for a while, but Wilson's 1942 paper in Nature eventually became one of the most frequently cited papers in crystallography and the Wilson plot is used to this day for scaling intensities and estimating temperature factors. Wilson left Cambridge in 1945 to take up an appointment as lecturer in the Department of Physics at University College, Cardiff. In 1946, he became a senior lecturer and Director of the Viriamu Jones Laboratory and then Professor of Physics and Head of Department in 1954, a post he held until 1965. At Cardiff, he founded a school of organic crystal chemistry that rapidly achieved world-wide recognition for its work on alkaloids such as ephedrine and harmine, on a number of terpenoids (longifolene etc.) and on amino acids. Donald Rogers, later Professor of Chemical Crystallography at Imperial College, Douglas Grant who went on to St Andrews and R. Gwynne Howells were associated with the structural work of the group. Former research students from this period include David Phillips, now Lord Phillips of Ellesmere, KBE, FRS, Emeritus Professor of Molecular Biophysics, University of Oxford, and former Chairman of the Advisory Board for the Research Councils. Eric Stanley became Professor of Physics of the University of New Brunswick, Sukeaki Hosoya was appointed to a Chair at the Institute for Solid State Physics, University of Tokyo, and Ray Hine, Reg Potter and John Richards subsequently joined the lecturing staff in the Department of Physics at Cardiff. The group contributed substantially to the theory and practice of structure solution; in particular, Wilson demonstrated, again from statistical considerations, that the symmetry elements of a crystal structure can be deduced from observed diffraction data (1949). These include the centre of symmetry, which had previously been thought impossible to detect by X-ray methods. Sir Lawrence Bragg said of this discovery `Like all brilliantly original ideas, it seems obvious when pointed out!' Many of Wilson's derivations of the statistical properties of weighted reciprocal lattices remain in common use. Soon after he arrived in Cardiff, Wilson became involved in providing data for the Powder Diffraction File (PDF), an activity which continued there for almost 30 years. Although the database and indexes were then published by the American Society for Testing and Materials (ASTM), they were compiled under the auspices of the Joint Committee on Chemical Analysis by X-ray Diffraction of the ASTM, the American Crystallographic Association and, in Britain, the Institute of Physics, through which the Cardiff work was administered. The Viriamu Jones Laboratory soon became the main centre in the UK for collecting data for the PDF, in those days by means of a Debye-Scherrer camera, and for editing data submitted by other laboratories in Britain. A Research Assistant, Beti E. Lewis, was appointed in September 1947 to undertake this work, initially under the direction of Wilson. John W. Hughes supervised the project from 1954 until he and Beti Lewis retired in September 1975, some five years after the Joint Committee on Powder Diffraction Standards (JCPDS) had been formed to manage and distribute the PDF. Wilson's abiding interest in powder diffraction originated while working at Cambridge, but prior to that he had developed a life-long friendship with Bill Parrish when both were post-graduate students with Bertram E. Warren at MIT. From this association stemmed their joint work on diffractometry; indeed, Parrish and Wilson were the pioneers of the modern powder diffractometer, Parrish being responsible for its design and characterization, while Wilson developed the theory of diffractometry and other aspects of powder diffraction. In the late l940s, after a visit to Parrish at the Philips Research Laboratory in New York, he brought a device to Cardiff which may well have become the first counter diffractometer in the UK. This was a special goniometer developed by Parrish during the war for routine determination of the orientation of quartz oscillator crystals and it was adapted by the department's workshop to serve as a rudimentary powder diffractometer. It was used by John N. Eastabrook, a postgraduate student supervised by Hughes, whose thesis, submitted in 1955, was entitled Construction and Applications of a Geiger-Counter X-ray Spectrometer. This work resulted in the publication during the 1950s of a number of papers on various aspects of powder diffractometry, the first of many from the Viriamu Jones Laboratory. Following this early success, Wilson received support from the Joint Committee to continue development of diffractometry. A commercial vertical-circle diffractometer, again designed by Parrish, was purchased and funds were provided for a succession of Research Assistants - E. Roy Pike (1954/58), later a Fellow of the Royal Society and Clerk Maxwell Professor of Theoretical Physics at King's College, London, Brian W. Delf (1957/1961; MBE 1995), who joined the lecturing staff at Cardiff and J. Ian Langford (1961/66), who subsequently went with Wilson to Birmingham. The first and last of these were principally concerned with the design and construction of a system for programmed control of the diffractometer and for the storage of data on paper tape, the forerunner of the modern automatic powder diffractometer (APD). This resulted in a dramatic increase in the quantity of diffraction data obtained, together with an improvement in quality. All three Research Assistants contributed to the theory and practice of powder diffraction and to the practical implementation of Wilson's use of statistical concepts for a precise determination of the positions and breadths of diffraction line profiles. This work, together with Wilson's own contribution, was published in The Mathematical Theory of X-ray Diffractometry in 1963, a companion volume to Parrish's X-ray Analysis Papers (1965). Together with H. P. Rooksby and H. S. Peiser, he was Editor of X-ray Diffraction by Polycrystalline Materials (1955; revised 1960) and MSc lectures he delivered at Cardiff formed the basis of Elements of X-ray Crystallography (1970). Thus, over a period of 20 years and due in no small measure to support received from the Joint Committee, the Viriamu Jones Laboratory at Cardiff enjoyed a reputation as one of the principal centres of powder diffraction world-wide. In recognition of his substantial contribution to this field, and also to single-crystal diffraction, Wilson was elected a Fellow of the Royal Society in 1963. In addition to pursuing the research activities engendered at Cambridge, Wilson had a life-long interest in editorial work and his contribution to presenting and disseminating scientific information is incalculable. In 1948, he became Editor of Structure Reports, a systematic and critical compilation of crystal-structure determinations and successor to Strukturbericht, the publication of which had been suspended during the war years. This initiated a major leadership role in the publication activities of the International Union of Crystallography, which continued without interruption throughout his life. In 1960, he succeeded Paul Ewald as Editor of Acta Crystallographica, a post he held until 1977. Acta, then the principal publication of the IUCr, thrived under his editorship, expanding to two volumes, with a fivefold increase in publications. As Editor of Acta, he was also Chairman of the Commission on Acta Crystallographica from 1960 to 1967 and, following the launching of the Journal of Applied Crystallography in 1968, Chairman of the Commission on Journals. From 1960 to 1977, he was the first Chairman of the Commission on Crystallographic Nomenclature and subsequently continued to be an active ex officio member. His strong interests in powder diffraction led to his appointment to the Commission on Crystallographic Data for many years. In addition to these editorial duties for the IUCr, he was Associate Editor of the Proceedings of the Royal Society from 1978 to 1983. He became associated with the ICSU/UNESCO Committee on Physics Abstracting in 1948 and actively represented the interests of the IUCr on its successor organization, the Abstracting Board of the International Council of Scientific Unions (ICSU) from 1951 to 1984. This became the International Council for Scientific and Technical Information (ICSTI), on which Wilson served until 1990, as Vice-President from l980 to 1986. He was also Vice-President of the IUCr from l978 to 1981 and was a member of the Executive Committee for many years. S. C. Abrahams has furnished an admirable account of Wilson's long association with the IUCr in his 80th birthday tribute [Acta Cryst. (1994), A50, 655-657]. In 1965, Wilson was appointed Professor of Crystallography in the Department of Physics at the University of Birmingham, where he continued to pursue his research interests and editorial activities, and few aspects of crystallography, single-crystal and powder methods, were not covered in the 300 or so papers and other works he published throughout his career. During his years at Birmingham, he was Visiting Professor at the Georgia Institute of Technology, USA (1965, 1968 and 1971) and at the University of Tokyo (1974). He continued to represent the Institute of Physics on the Joint Committee until the mid-1980s, regularly attending the Spring and Autumn meetings in Philadelphia, and in 1984 he received the Distinguished Fellow Award from the International Centre for Diffraction Data, successor to the JCPDS. UK representation on the ICDD was subsequently transferred to the British Crystallographic Association, the link being maintained through the Association's Industrial Group. Wilson was in fact involved in the formation of the BCA and became a founder member at the inaugural meeting at Durham University in 1982. He retired from his post at Birmingham later that year and was made Emeritus Professor of the University. Dalhousie University awarded him an honorary Doctor of Laws degree in 1991 and the text of his address at the conferring Convocation, appropriately entitled Serendipity, was published in Crystallography News [(1992), 40, 17-22], the quarterly journal of the BCA. He returned to Cambridge in 1982 and during his retirement he took on the Chairmanship of the IUCr's Commission on International Tables and was appointed Editor of Volume C. The two series of crystallographic tables published previously had been widely distributed and were heavily used by crystallographers world-wide, but were in need of revision. He and Parrish provided much of the content of Volume C concerned with powder diffraction, as they had for the earlier Volume II (1959) which it replaced. At the time of his death, Wilson had in fact been putting the finishing touches to a further revision of Volume C, Volumes A (third edition) and B having appeared in 1992 and 1993. Arthur Wilson was a member of the Society of Friends and during his `retirement' was Clerk of the Jesus Lane Meeting, Cambridge. Despite his crystallographic commitments, he also found time to become actively involved in the University of the Third Age, an extra-mural body in Cambridge that arranges meetings and discussions for older people - an interest he shared with his wife, Harriett. An enthusiast for mountain walking, he was a life-member of the Rambling Club and a member of the Alpine Club and the Sierra Club (San Francisco).